California Split should really be called California Existential Vacuum of Woe, but that probably isn't as good a card trick. 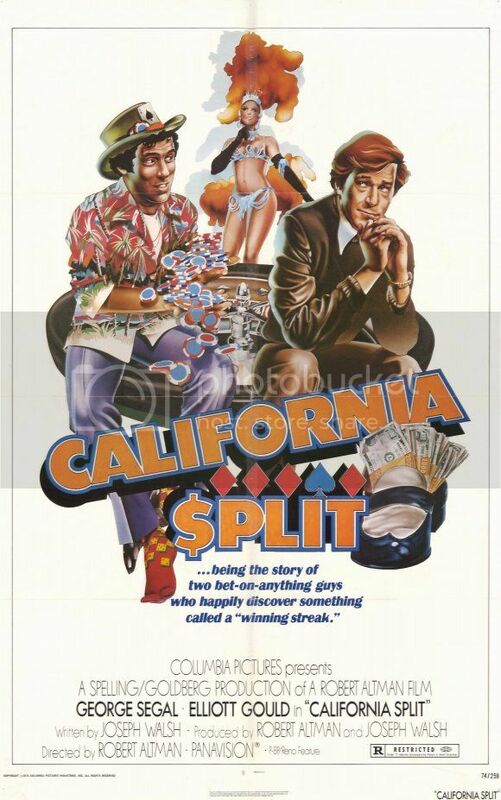 An intimate, bleak film, Robert Altman's California Split is the gambling addiction under a microscope. Two serial gamblers, Charlie (Elliott Gould) and Bill (George Segal), meet cute over some low-stakes poker drama and become friends. But, like drinking buddies or heroin buddies or any other type of bad-influence buddies, their raucous, drunken, blazing friendship just makes them spin closer to the abyss that always threatens to consume them. While Charlie lives in a run-down house with two low-level prostitutes, Barbara (Ann Prentiss) and Susan (Gwen Welles), Bill is a yuppie struggling to stay afloat. Like Altman's other film, MASH, California Split is less about narrative, and more about atmosphere and mood. Here, the mood is grim - almost oppressively so, since there's a facade of 24-hour partying which never honestly admits the deep, psychic cracks that lay beneath the surface. We follow the troupe of four on their picaresque, bohemian adventures - full of chaotic, boozy, grimy locales, dollars flying, the thrill of victory and the crush of defeat. But things just get worse and worse, the stakes climbing ever higher, good humors evaporating, until Charlie finds Bill pawning off all his possessions for one last-chance do-or-die high-stakes gamble in Reno. Gambling together, beat up together. Segal really carries the film as Bill's fall is really the most cataclysmic, breaking even Charlie's heart. We didn't realize George Segal (1) ever did drama, (2) ever was young, and so it was a happy surprise to see him young, and delivering such a powerful performance. Elliott Gould was his usual charming, "all cheap and debonair" 1970s persona. And this movie is your pretty standard 1970s American indie about deprivation, depravity and really awesome fashion.